You Are Here: Home / The Blog / Learning Center / What is Travertine? Travertine is a natural stone like Marble, Granite, Onyx, Limestone, Slate etc. The key differences between Travertine and other natural stones stems from the way they are formed. The stone themselves have very different properties such as the hardness of the stone and the appearance. 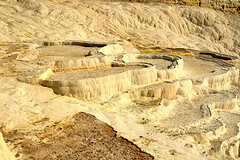 Travertine is formed in hot springs and/or limestone caves. It is formed by the precipitation of calcium carbonate. In other words, a chemical soup very high in concentration of calcium carbonate precipitates off the liquid and the remaining chemical soup hardens and is compressed into the travertine stone we have today. Kind of like a natural concrete in that you have a soupy mixture that hardens. Travertine is not the same as Marble, Granite or Limestone which falls in the metamorphic rock category. Key characteristics of Travertine stone are the holes within the stone which are caused by carbon dioxide evasion or CO2 bubbles in the mixture as it is setting. Metamorphic rock is a rock that has undergone changes through usually pressure and heat. It causes the rock to change or go through a “metamorphosis” that often forms crystals in the rock giving granite that sparkling look. Travertine has been used for centuries as a building material. The most famous structure built with it is the Coliseum in Rome, Italy but there are tens of thousands of buildings travertine has been used to construct. 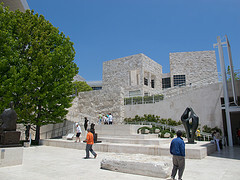 One of the most recent famous buildings would be the Getty Museum in Los Angles, California.